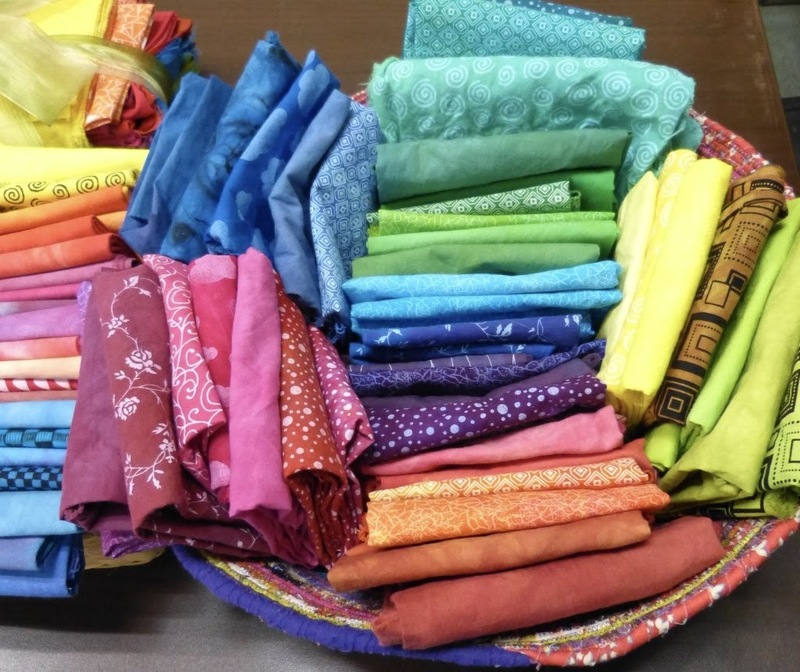 Mountain Art Quilters: Our September meeting turned out to be jam-packed with beautiful Show and Tell offerings, tons of great ergonomic sewing advice, and some impressive brags. 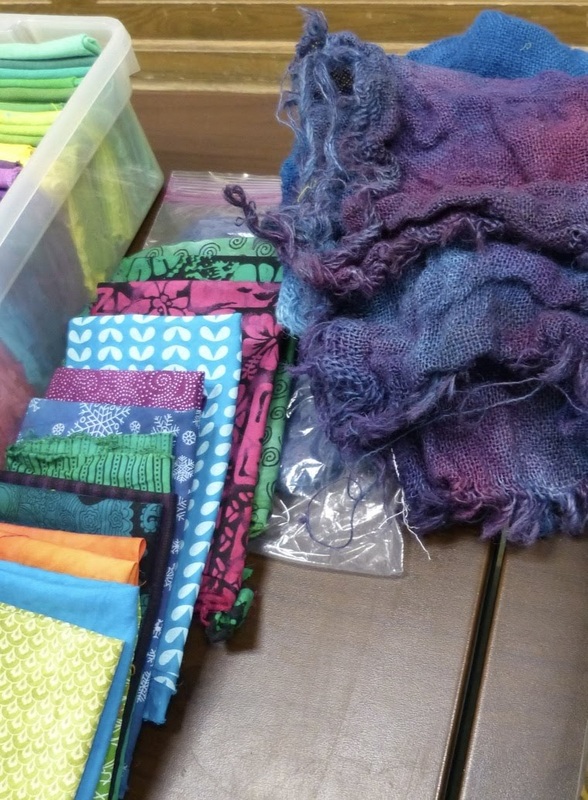 Our September meeting turned out to be jam-packed with beautiful Show and Tell offerings, tons of great ergonomic sewing advice, and some impressive brags. Jeanie Ferguson shared her newest projects -- batik pants for herself and knitted dresses for her granddaughter. 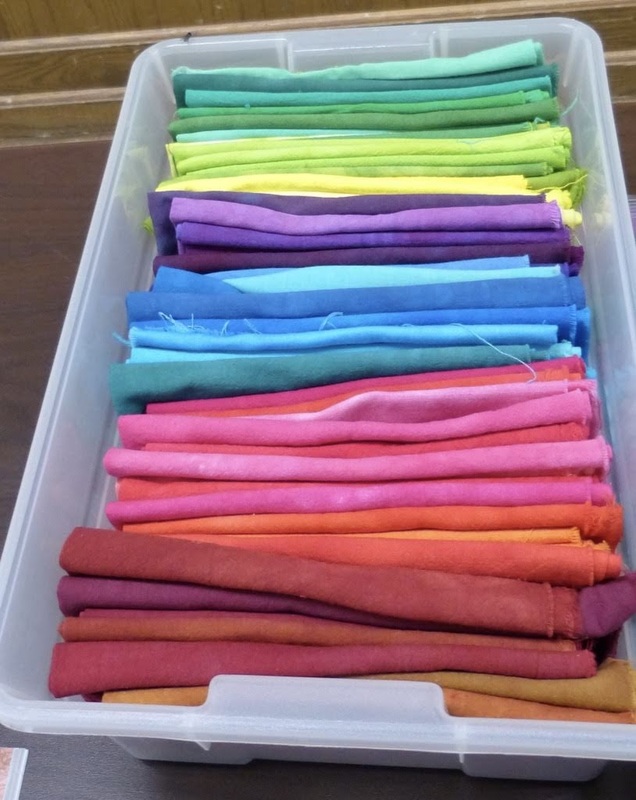 Lynda Lasich brought pillows she created in a Mary Boalt class. She used Lumiere paints and varnish to achieve this effect. 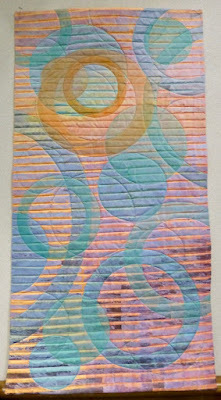 Sig Simonds created this circle quilt using poly organza, lines of paper, acrylic medium all layered with cottons and enhanced with paint. 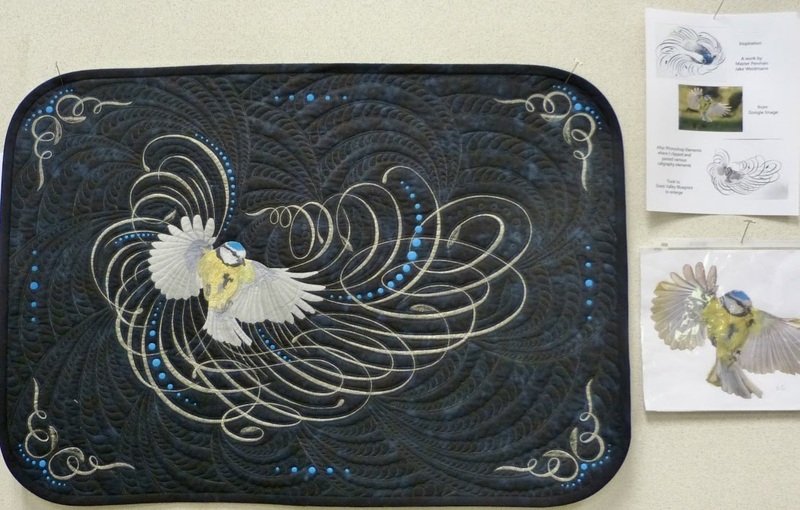 Jan Reed brought in her latest quilt, "Wingspread," which was inspired by master penman, Jake Weidmann. 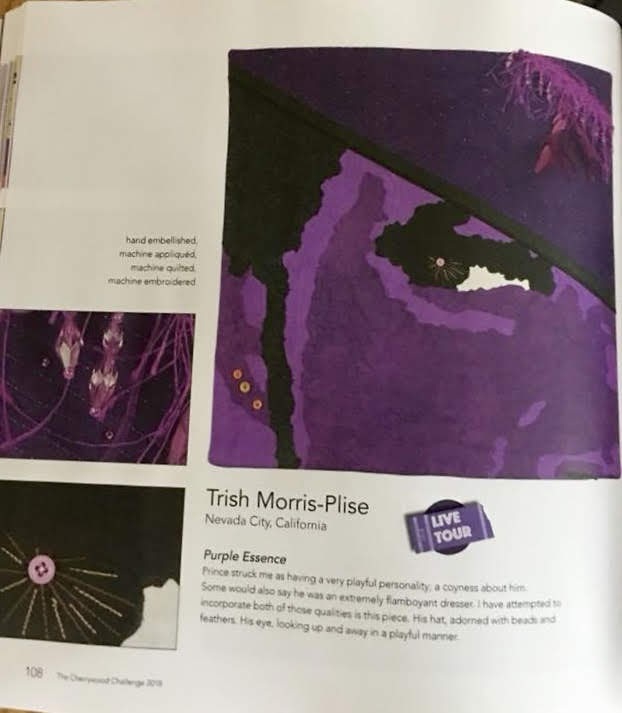 She created the bird design and had it enlarged at Grass Valley Blueprint, and from that she made an appliqué pattern on freezer paper. 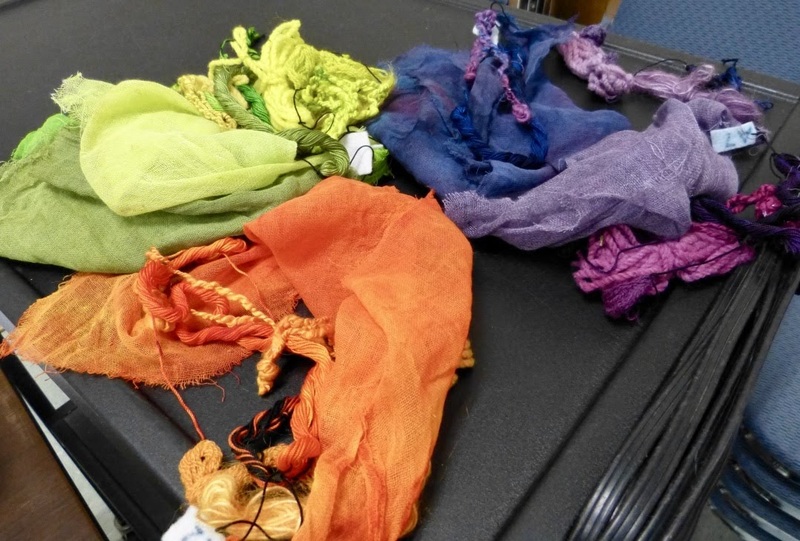 The bird was created on muslin, then cut out, heat set onto the black fabric using Misty Fuse, and zig-zagged down using monofilament thread. The golden swirls were transferred to the fabric using Clover's Chacopy paper and a Fons & Porter white mechanical pencil. She then used a filbert brush to apply Tsukineko Champagne Mist metallic ink. A big thank you to Jan for sharing not only her beautiful work, but also the process and products that made it possible. 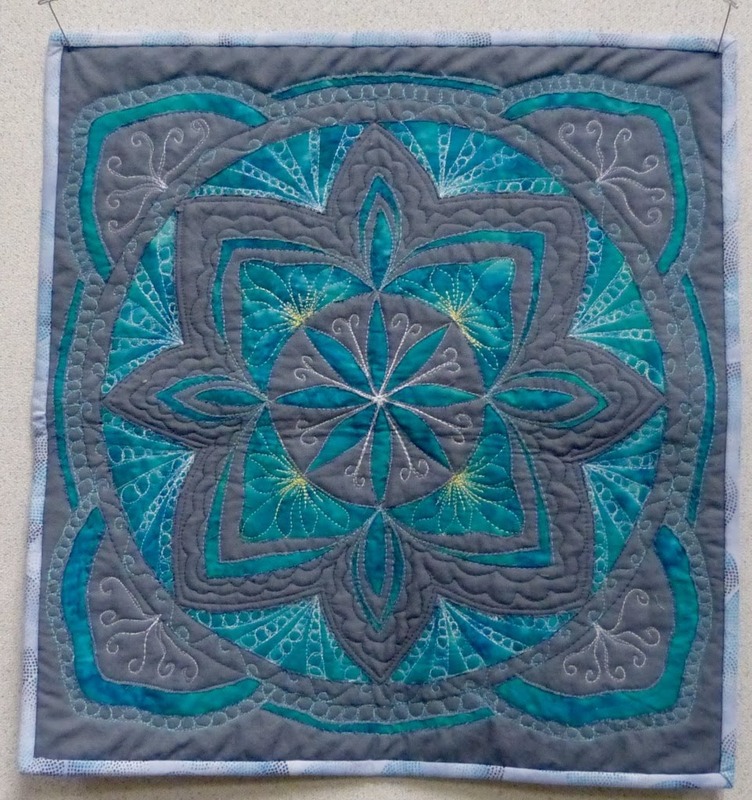 Sophia Day shared this quilt from a Mel Beach mandala class. 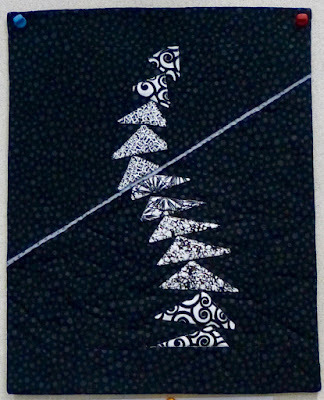 The image was created in two layers using reverse appliqué. 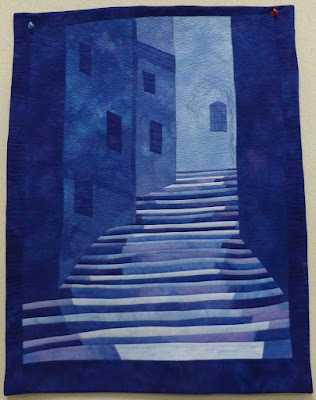 Jackie Manley created this study in values from a photograph she had taken of the Assisi Steps in Italy. 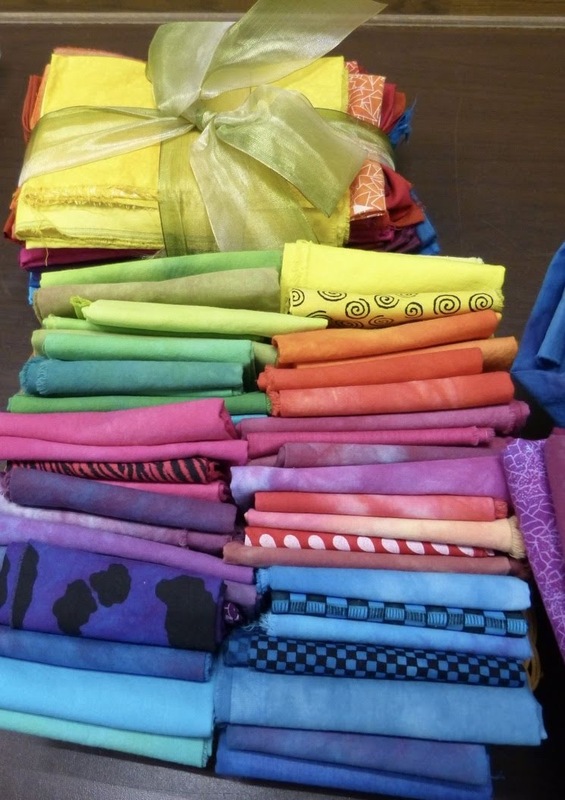 She created a freezer paper image coded by value to determine the placement of her hand-dyed fabrics, then quilted the piece intensely in a manner that enhanced the perspective. 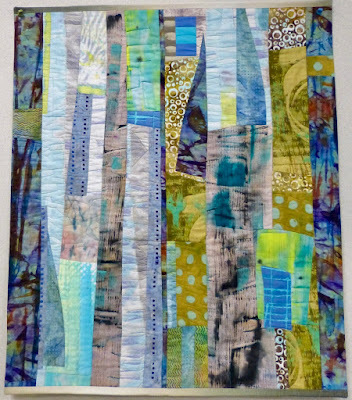 Anne Sanderson used hand-painted fabrics along with commercial fabrics from her stash to create this abstract quilt, "Urban Architecture." Like Jackie, Anne also worked with values, emphasizing contrast. She sewed the pieces into units and tried them out on a design wall before finalizing her design, constructing some curved pieces that are reminiscent of buildings in Barcelona. 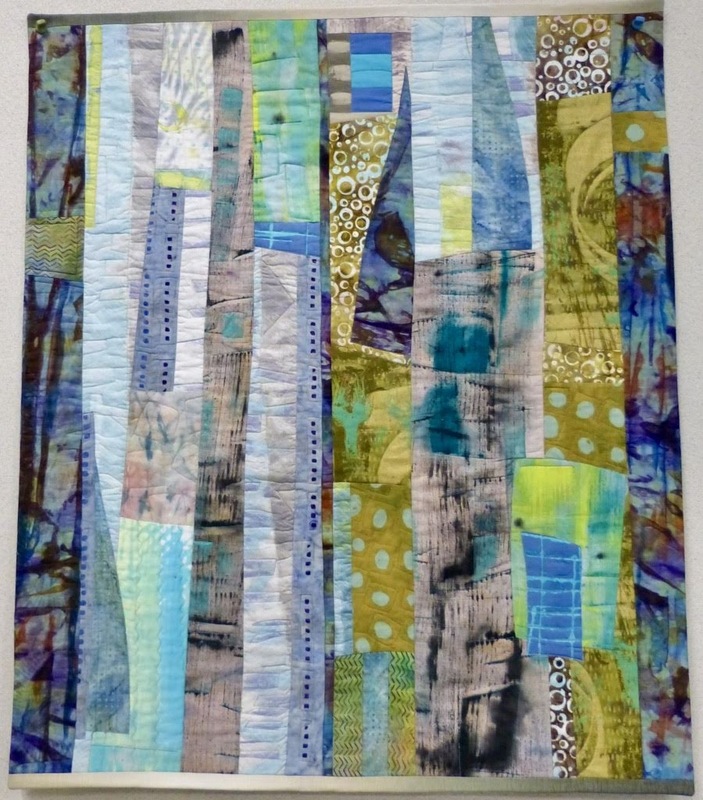 She quilted in sections, varying her quilting motifs as the fabric dictated, and added an ombre fabric on top and bottom borders to tie everything together. 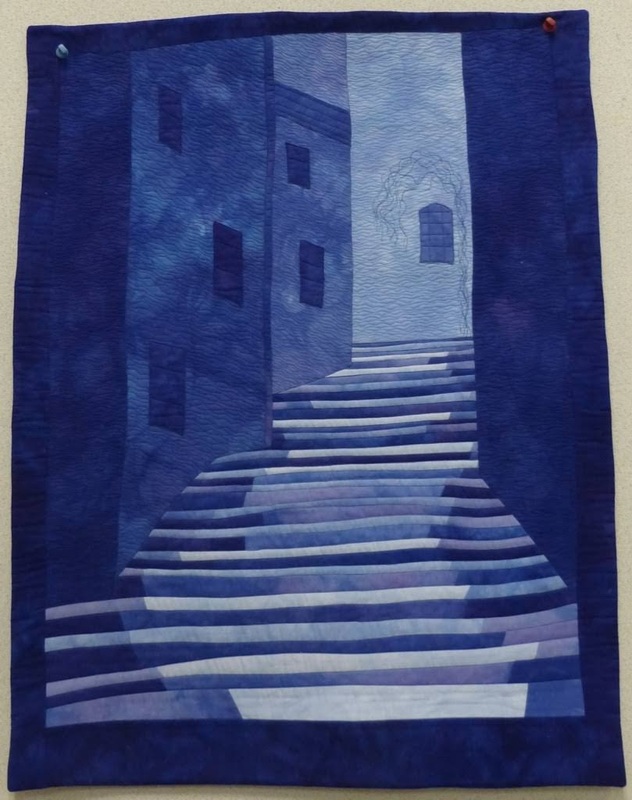 Julie Berry's quilt, "Flight Interrupted," began with a class from Sue Rasmussen on drafting irregular, curved, paper-pieced flying geese. The geese in the top portion of the quilt are surrounded by quilting that follows the curve of geese in a very orderly manner. 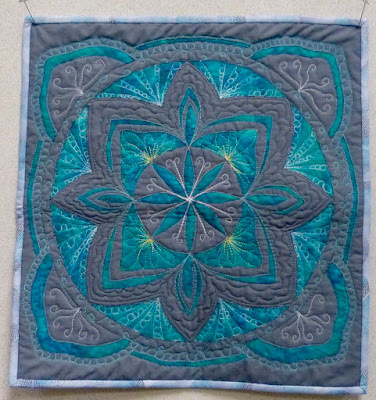 When the interruption occurs (the gray flange), the geese go off-course, and if you look closely at the bottom half of the quilt, you will see random geese flying in all directions. 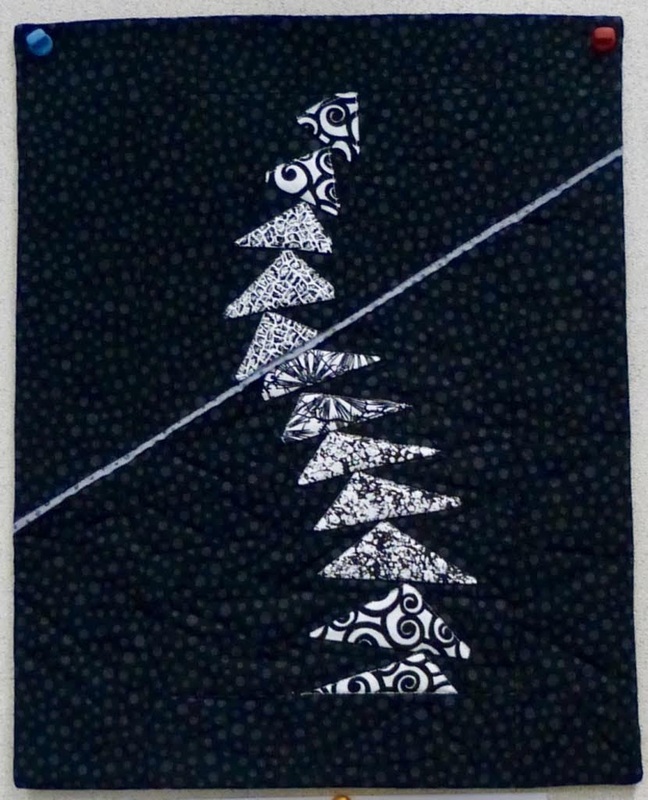 Julie wanted the quilting on this to be subtle, so she used black thread on the black background, but she feels that the quilting rather disappeared. 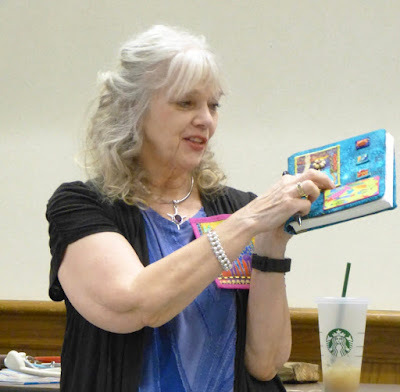 Inspired by our June meeting, Maria Brower and Marylee Drake both shared their journal covers. And we were treated to a rainbow of gorgeous fabrics, courtesy of Ginny Lee's dyeing class. Maria Billings tried dyeing different fibers in the same dye baths. 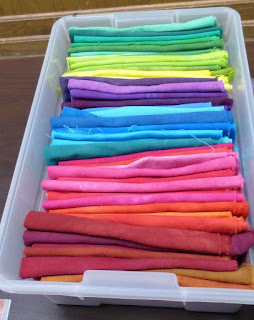 It was amazing to see the color variations she achieved. 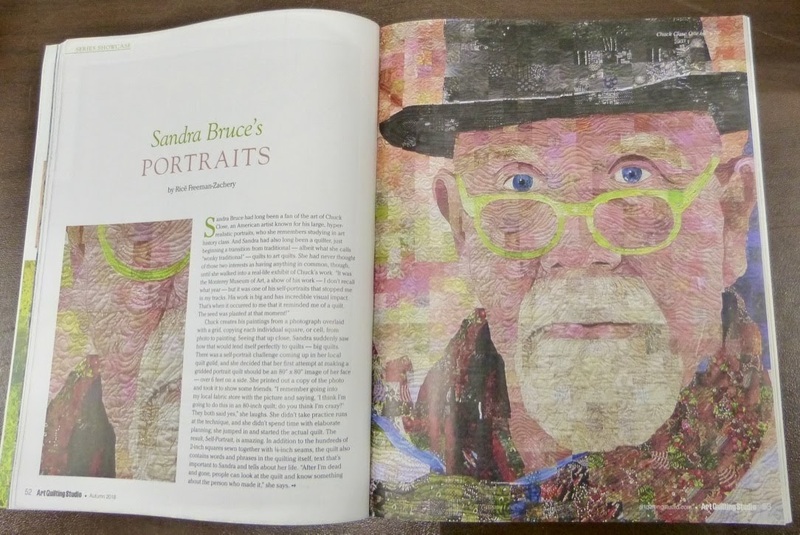 One of our former members, Sandra Bruce, was featured in an article in "Art Quilting Studio" magazine. 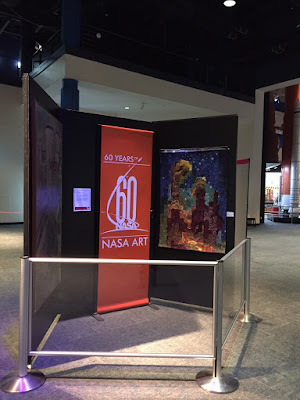 Robin Hart's quilt, "Pillars of Creation," based on a Hubble photograph of deep space, was one of only 25 works of art selected for NASA's 60th anniversary art exhibition. Robin's work hangs with that of Andy Warhol, Peter Max, and Anne Leibovitz, among others. And "Purple Essence," Trish Morris-Plise's entry in the 2018 Cherrywood Challenge, "Prince," is featured in a book by the same name, and will be going on tour throughout the US and Canada. 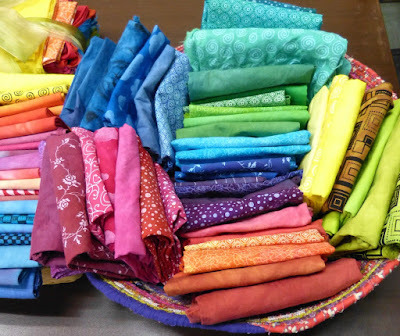 Congratulations, fellow quilters -- you do us proud! Last, but absolutely not least, our own Lynn Tubbe shared her extensive knowledge of the ergonomics of sewing. 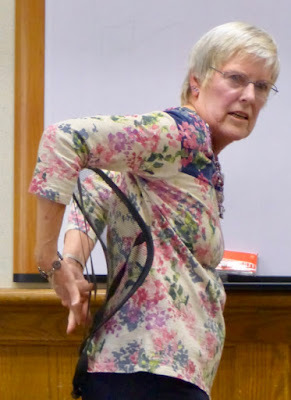 She showed us how risers can be used to bring our work tables into a more comfortable position, how we can support our backs while working, and so very much more! Thank you, Lynn for an excellent presentation!